I’ve always wanted one, preferably a huge one that runs around the room and delivers me snacks, but that’s not going to happen. 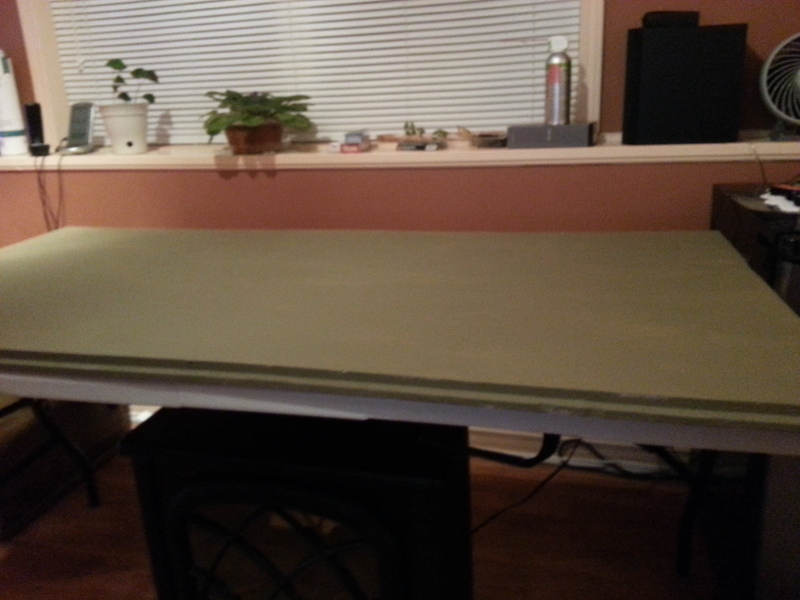 I did decide to start a small table top one tho, and I have plans for it. They’ll take time, and to be honest I’m not sure I have the talent to pull it off. But will give it a try and document my progress here on this page. This page will be a work in progress, but hopefully I can build something decent over time. 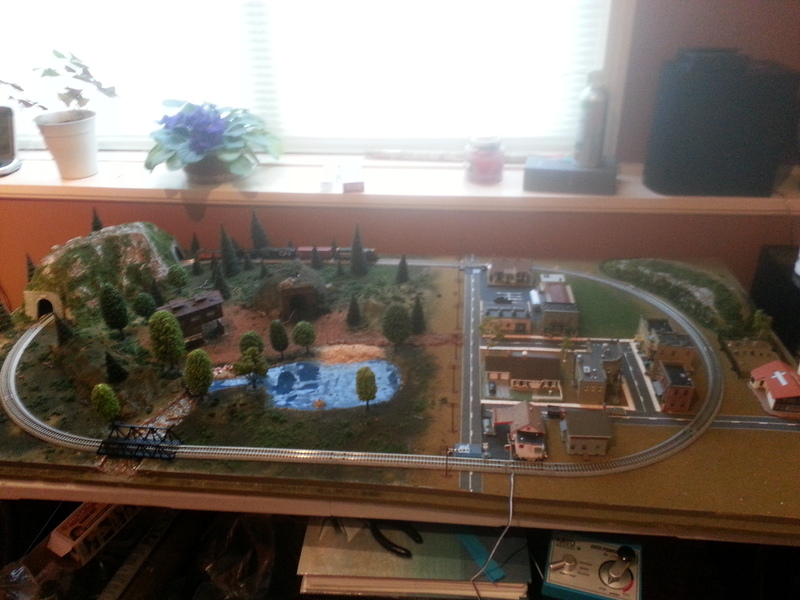 I did a lot of research, mainly helped by the staff at Maritime Hobbies, and decided to go with an N Scale set up. 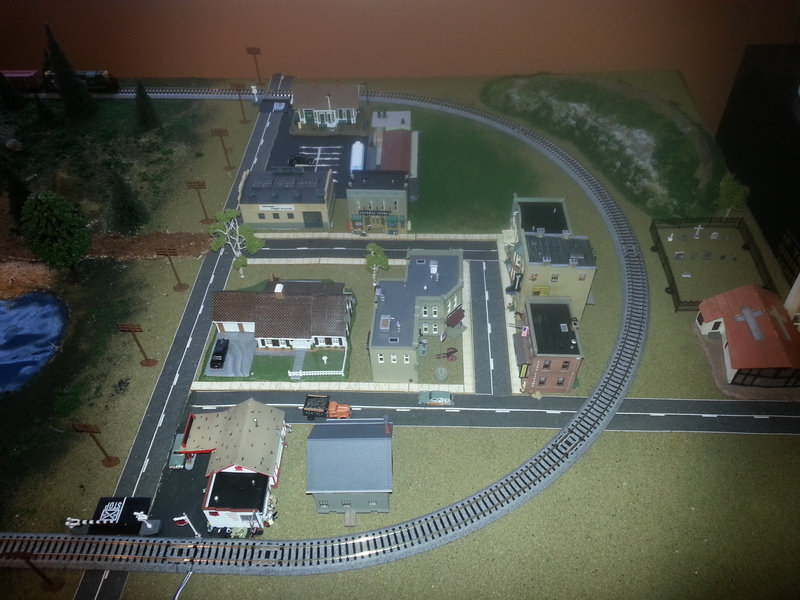 I bought a kato track system to get me started and a few cars. I may change this over time as there’s a flexible track I’d like to use, but I needed something to get started. This stuff is a lot more expensive than I realized! So hence the time. 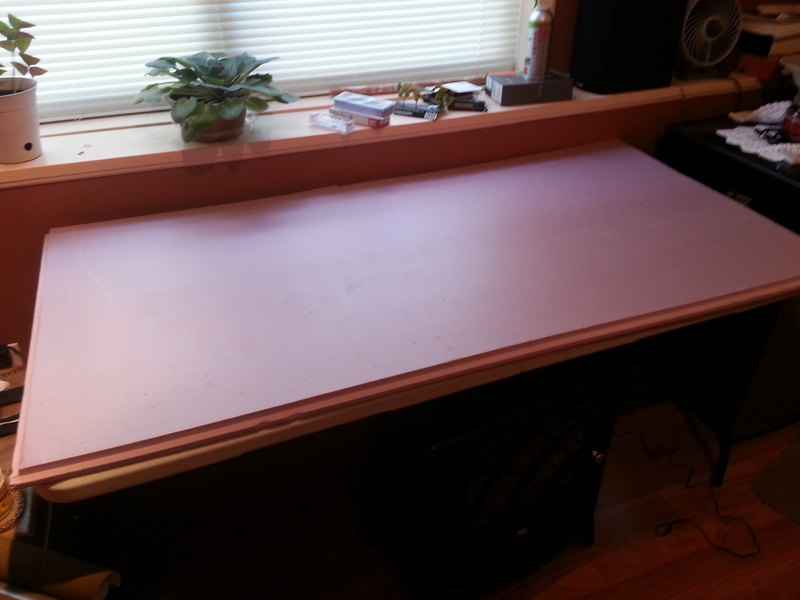 First off I don’t have a lot of space, so I started with a folding table – its 5′ x 30″ – and in order to be able to carve into is, I added a piece of foam insulation. Not styrofoam! I wanted something a bit stiffer so it wont flake off. Next I painted it (well my brother Keith did) to a base color which will not look out of place if it shows through when i’m done. 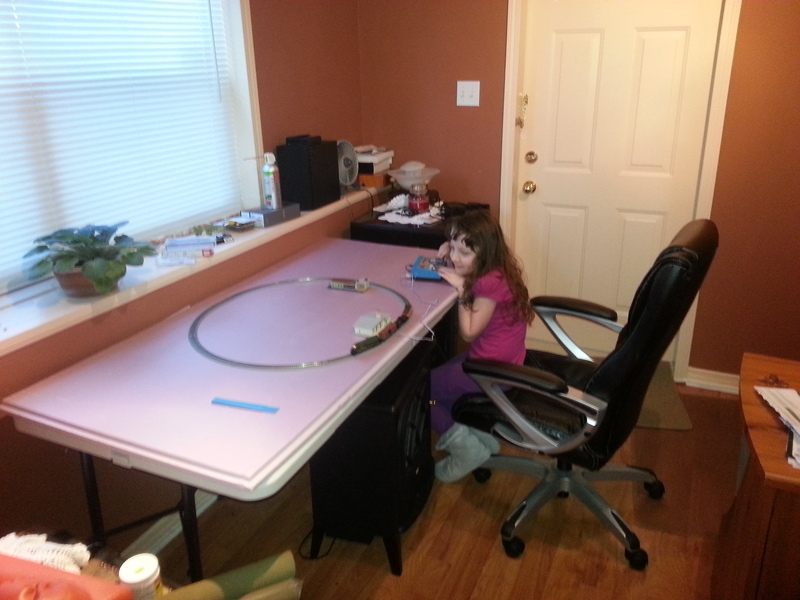 I’ve added a picture of my niece playing with the set partially assembled as well. 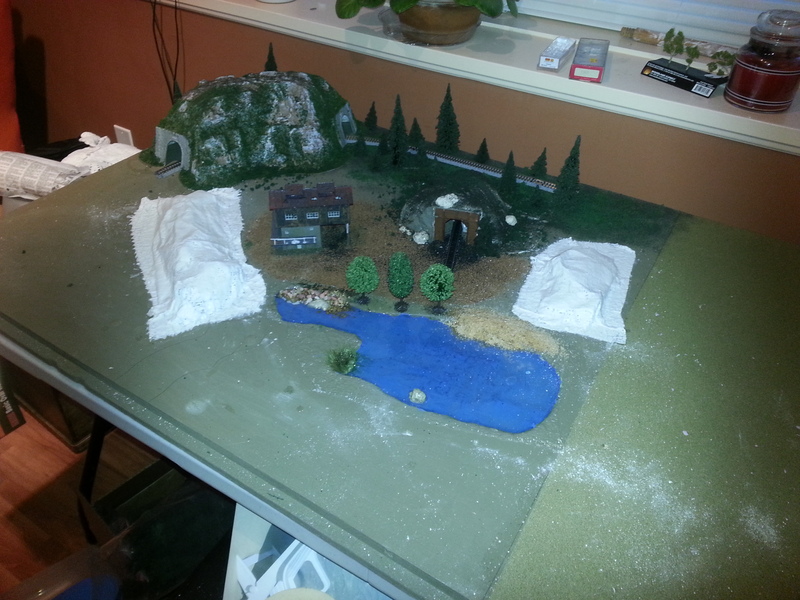 February 4, 2013: I’ve added a grass mat on the left. 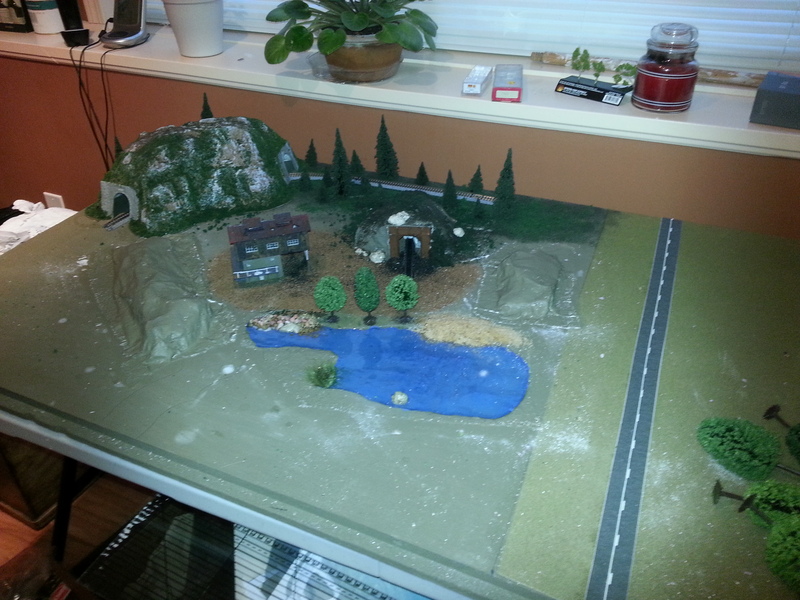 This will be the location of my town, and will build that when my materials arrive. It’s pretty square now, but will “naturalize” the edges when I add turf all over. 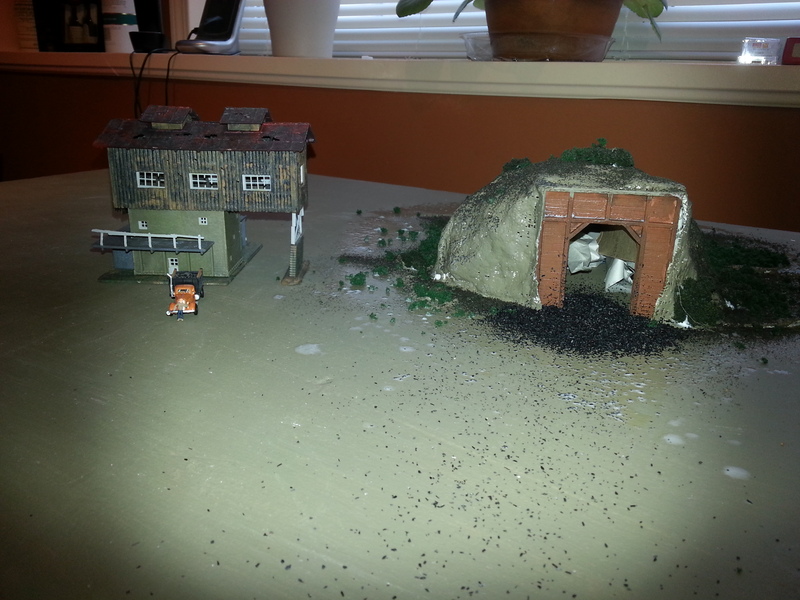 I’ve also build my coal mine, with the loading building. Plan to get a short end of rusty track coming out of the mine at some point and add a mine cart on it. 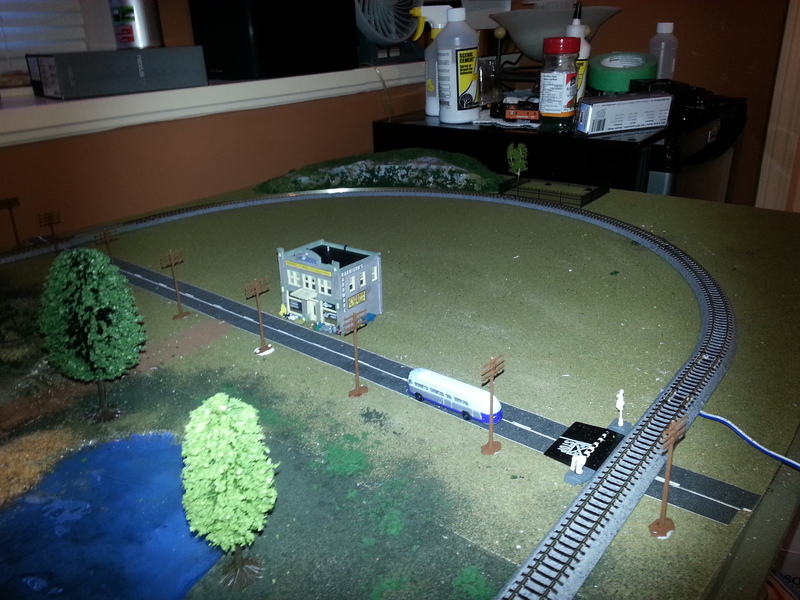 Hopefully someday maybe add some bins and piles of coal around the loading area, and have a track with an ore car under there leading to my main track. 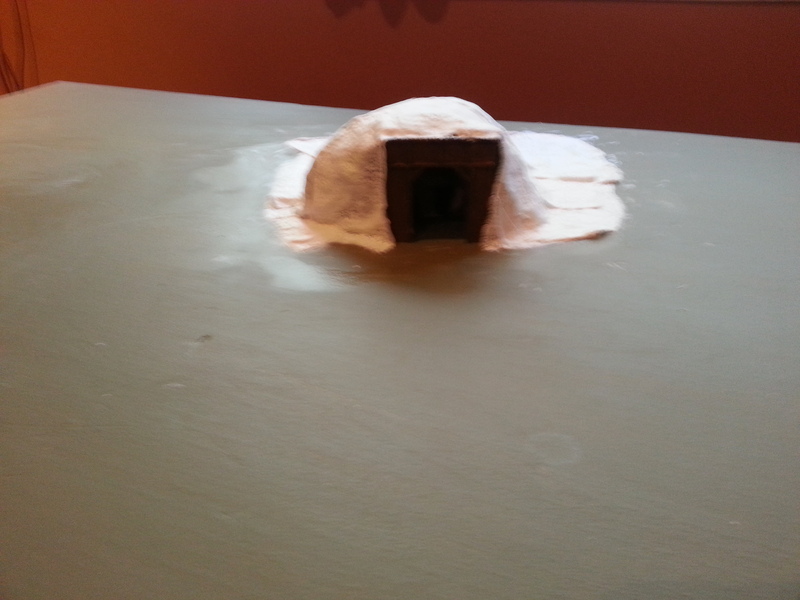 February 9, 2013: Tunnel arrived, and added, ridge too, but I’m not sure I have the room for it. 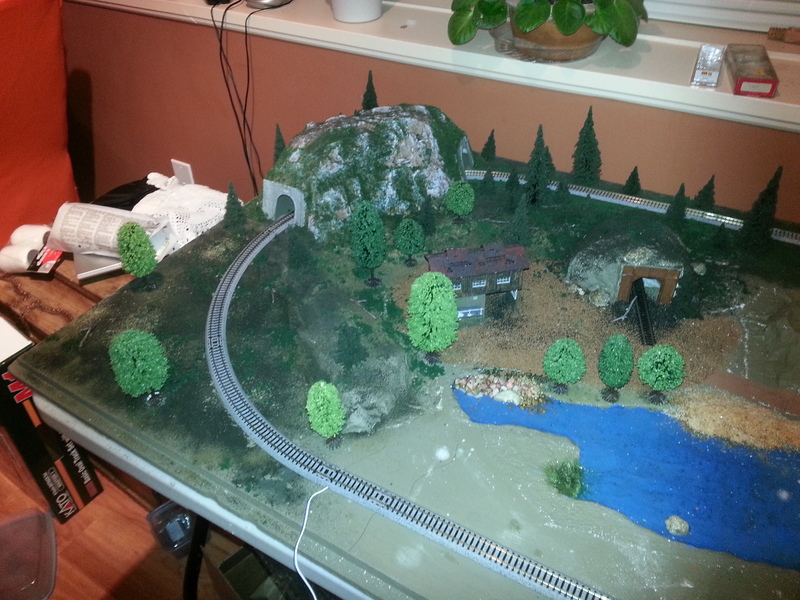 No picture of the tunnel yet, will add once I get lake done. 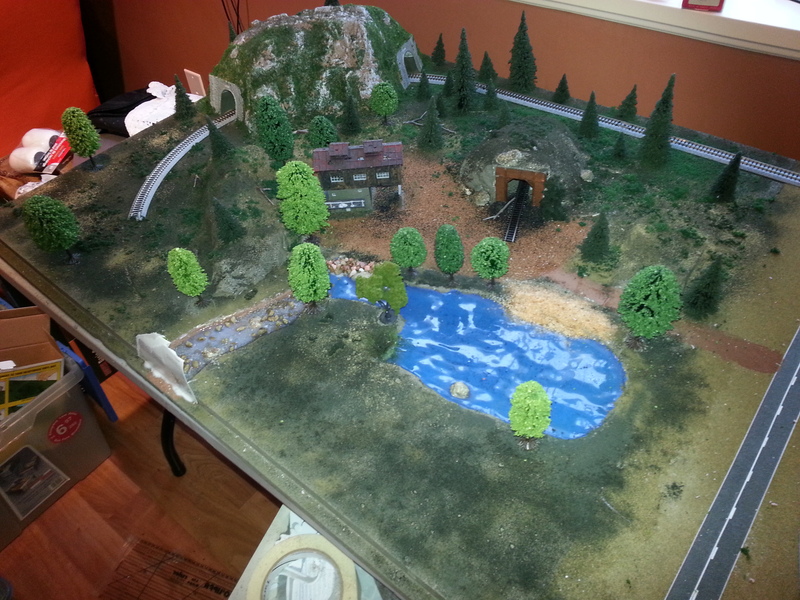 Pictures added of lake in progress. 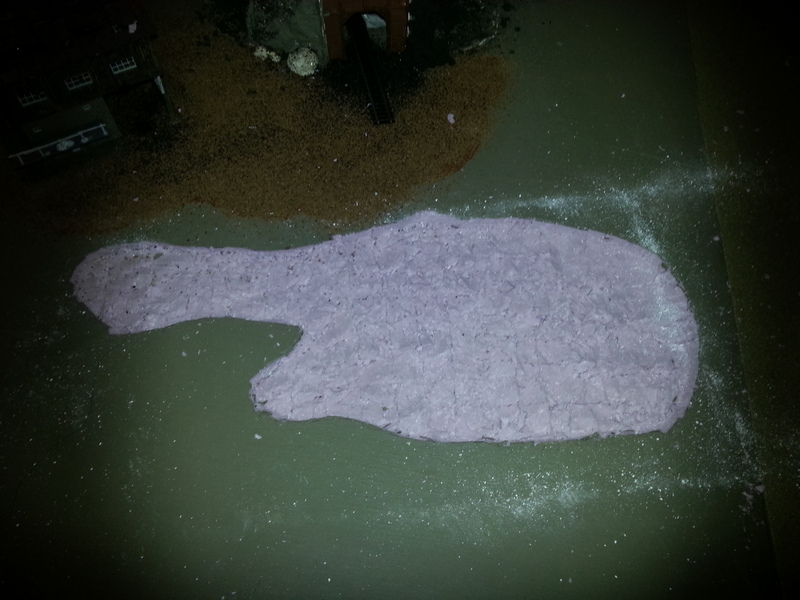 I dug out some of the foam which was a bit of a messy affair, and of course not smooth. But lake bottoms aren’t smooth anyway. 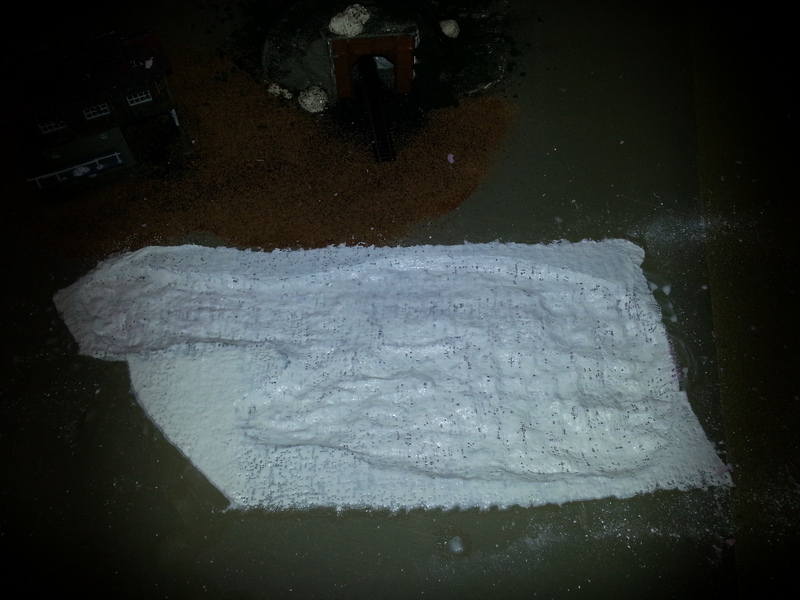 Added plaster cloth to the bottom to make it more rounded and paintable. Once dry will paint and prepare for the water treatment. February 15, 2013: Water has finally set. 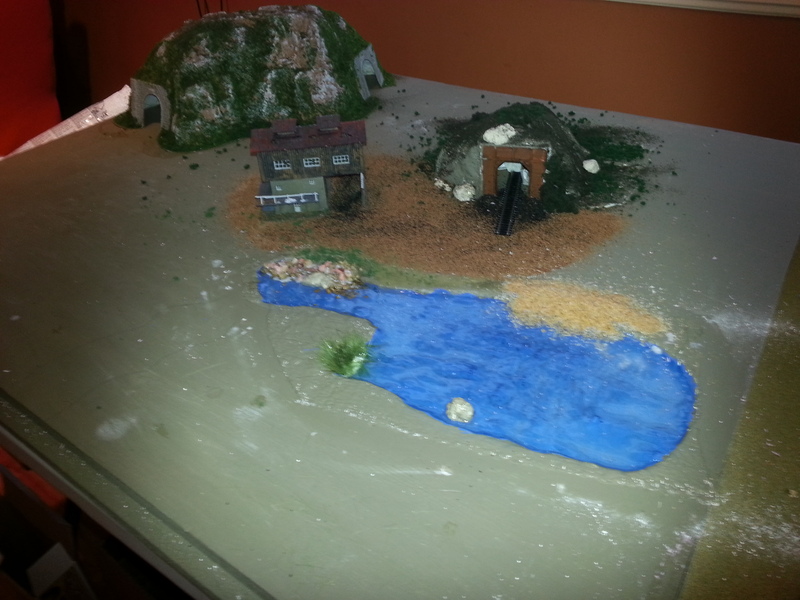 Added some more “beachy” looking sand, and more colorful rock area and a couple trees to give an illusion of separation from the mine. Pond grass in the corner. 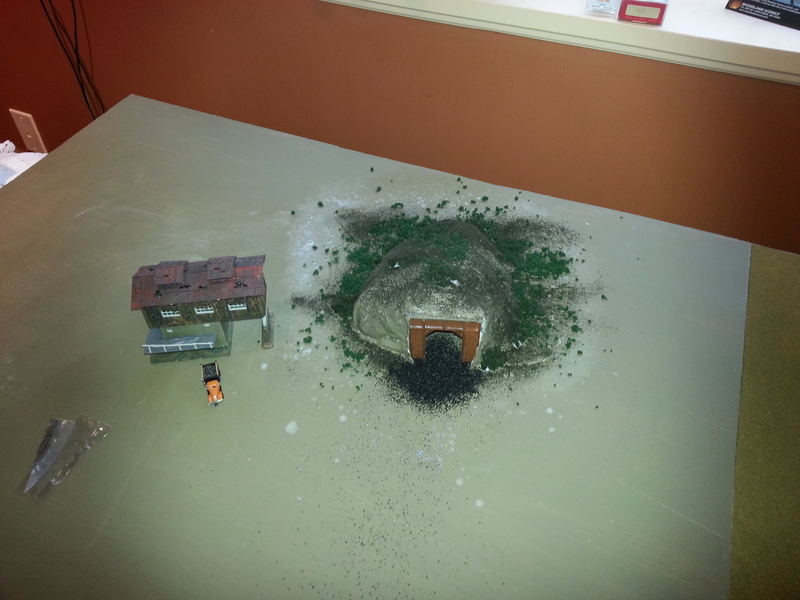 Also finished the bare spot behind the tunnel with some turf and trees. 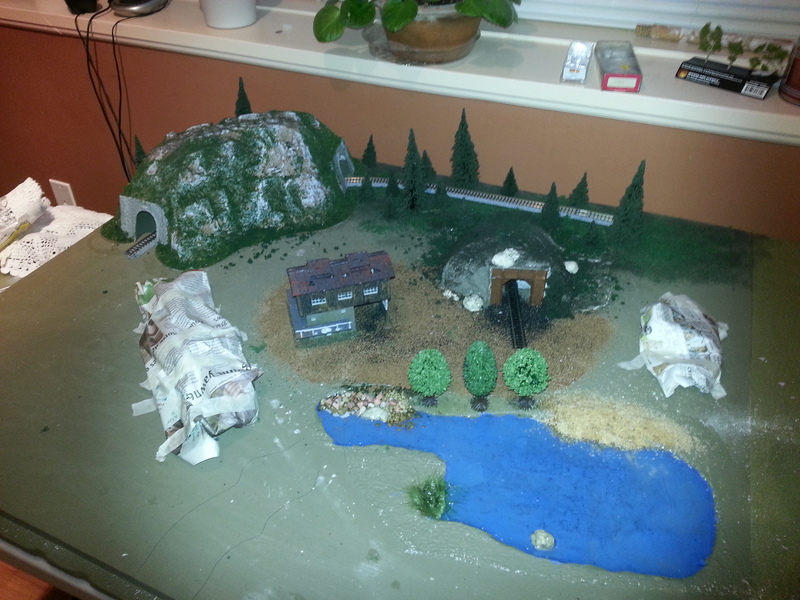 February 21, 2013: Have added a couple more hills, and added soil turf and trees to a lot more area. 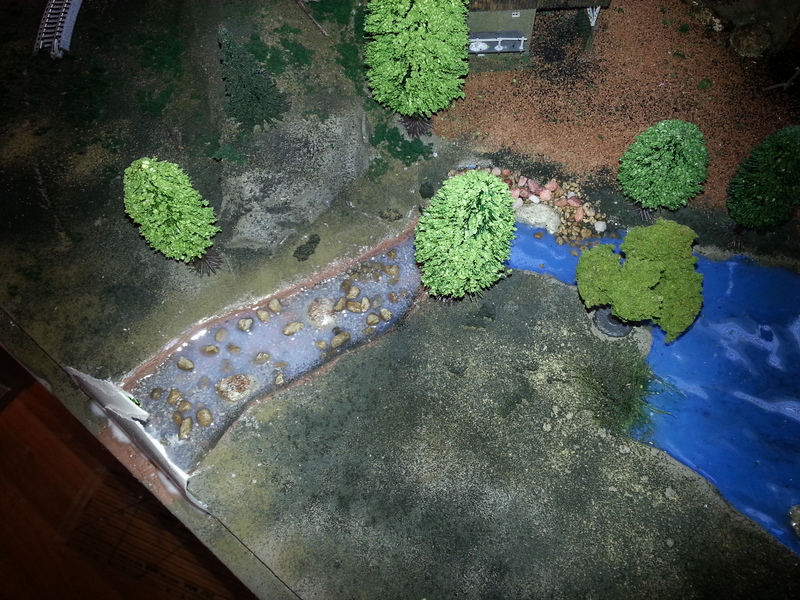 Have carved out a brook, and painted it and added rock and gravel. 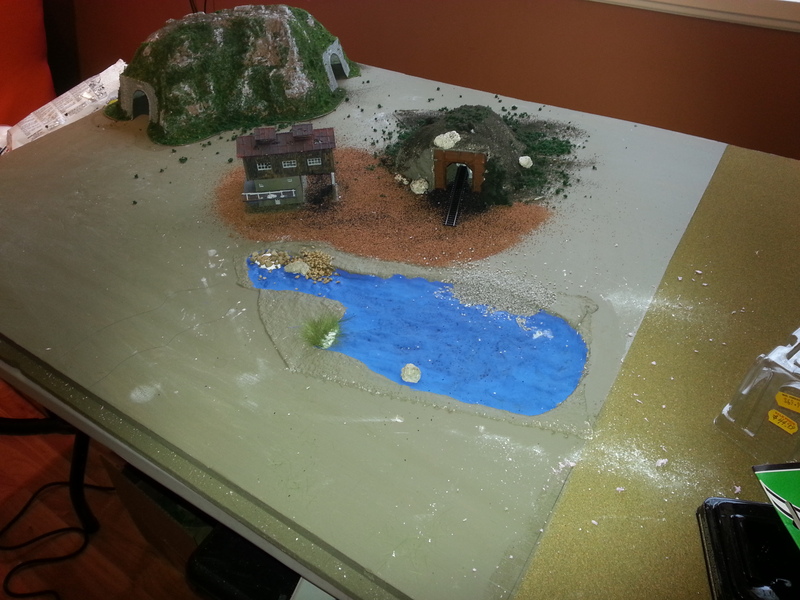 Will be adding water tomorrow/over the weekend and hopefully finishing up the “wilderness” area completely. Well as much as it will ever be complete. I have some aesthetic items to add. Campers with tent and campfire on order, as well as some animals, fisherman for the lake and beach goers for the beach. 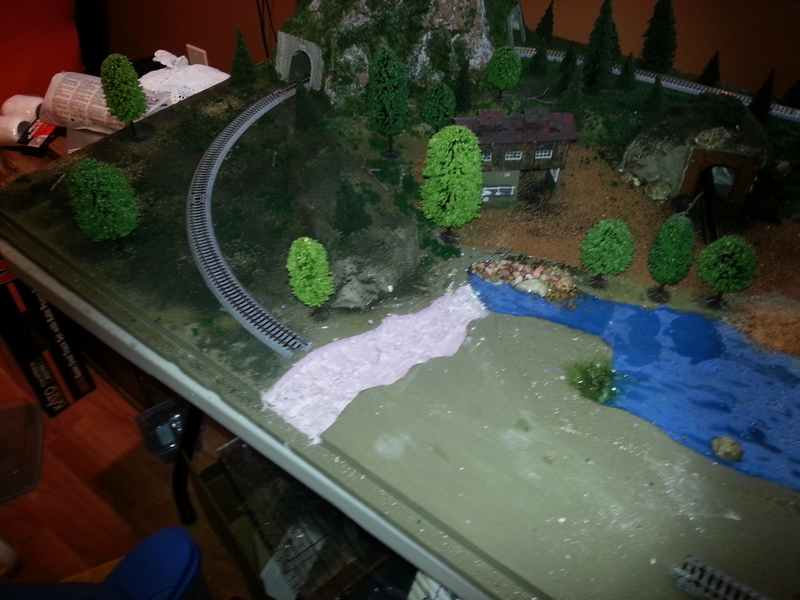 Also need to get a trestle for the river area, but that may require changing my track type as everything I see so far to match my track is waaaaaay too long to please me. March 18, 2013: Finally received an order from my hobby supply company, delays in usps, delays in customs, ugh. Anyway, not had a lot of time to do anything with it yet, but added a couple pictures of my campers and my church/graveyard setup. More to come very soon. Also received my 10 dollar lighter cam from ebay, test run below, needs better light, and better angle, but had to test! Town is pretty much done. Parking lot around station, bus depot and warehouse. 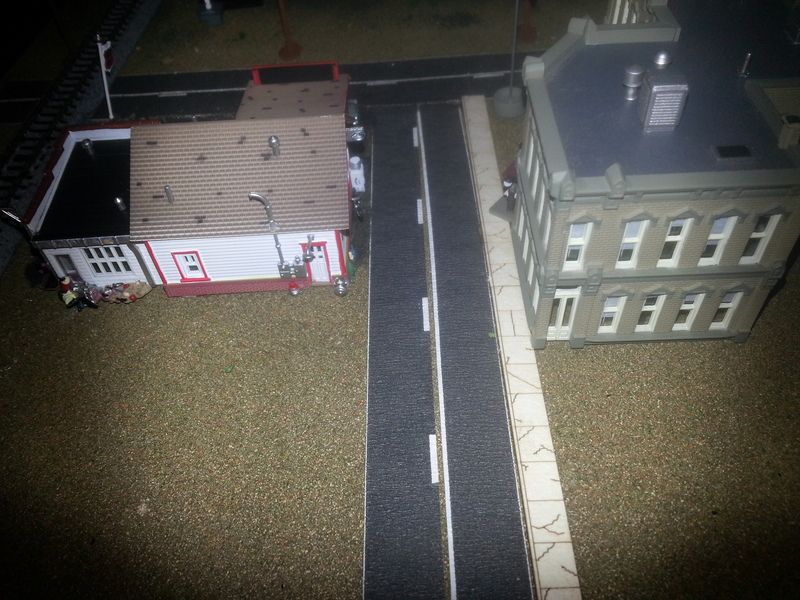 Roads and sidewalks with some businesses and houses. 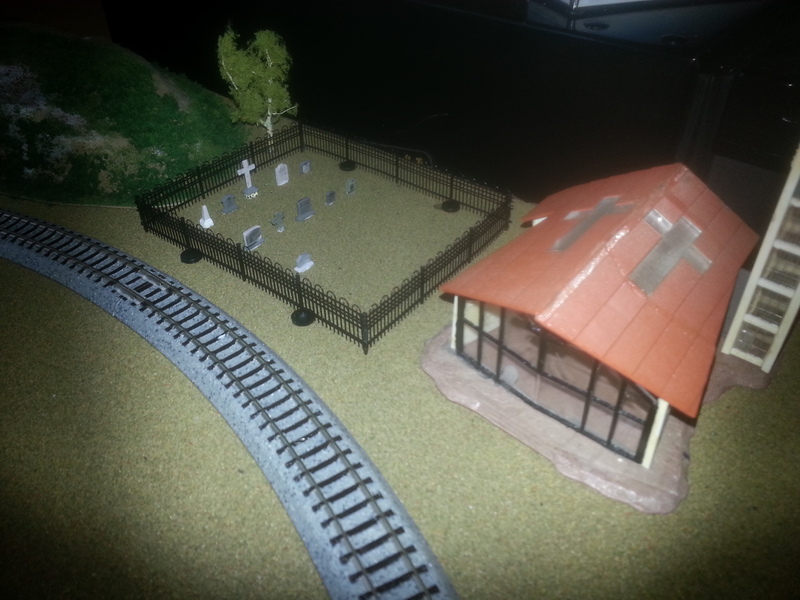 Want to get a picket fence around the smaller house, a few more little things on order. 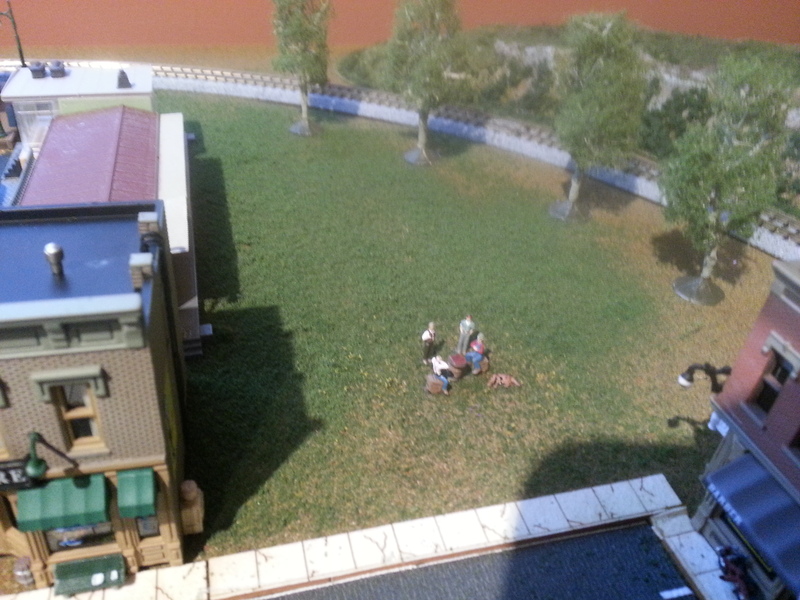 Added a park area in back right. Some older gentlemen are idling a summer day playing checkers there now. I’ll update the gallery as I go. 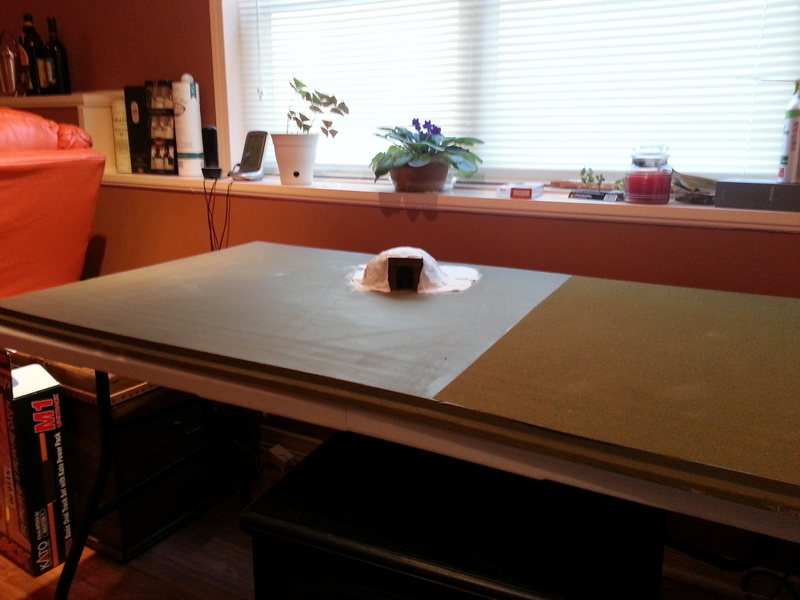 Foam Core Insulation cut to fit the table. My niece playing with the train, not a permanent look. 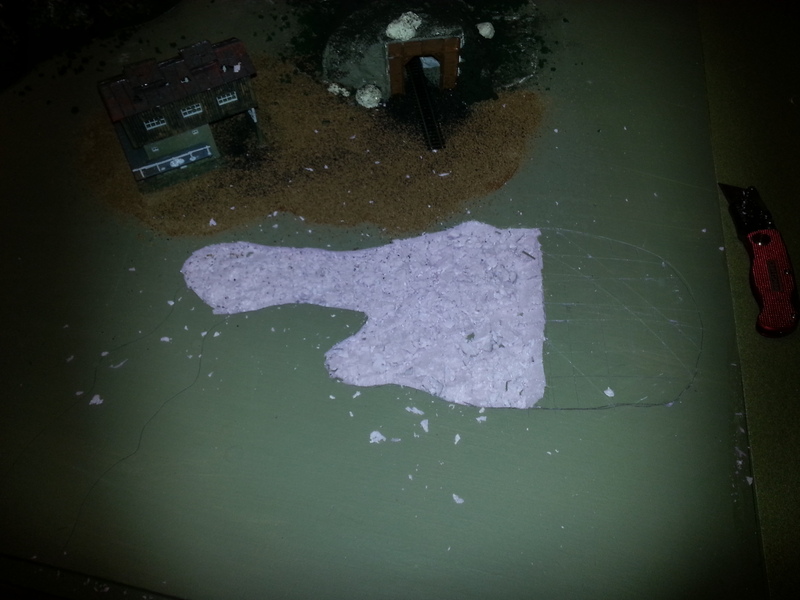 Foam core painted to a base colour. 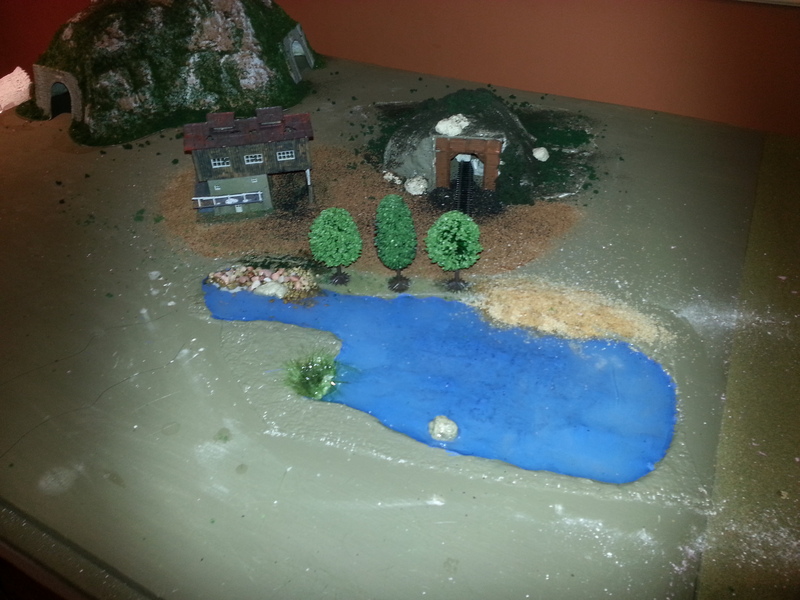 Water has finally set in the lake, beach, and rocky shore, and a couple trees. Still looks kinda ugly with no real surroundings, but it will come. 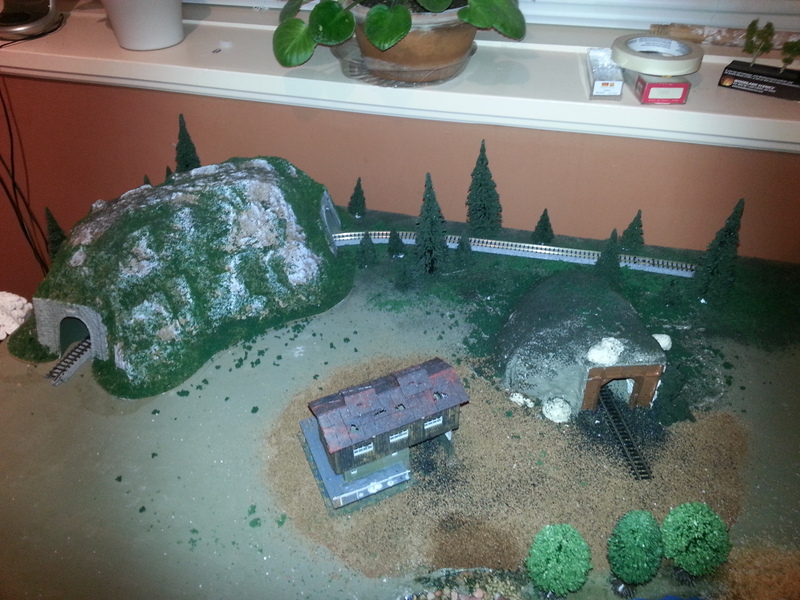 Corner behind the tunnel, added turf and a few trees to finish that bare area. 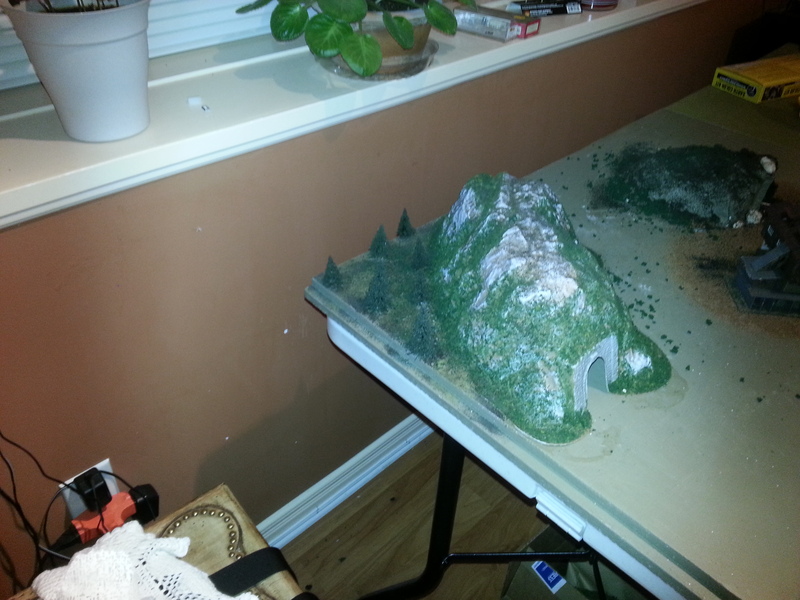 Added some forest around back of track. 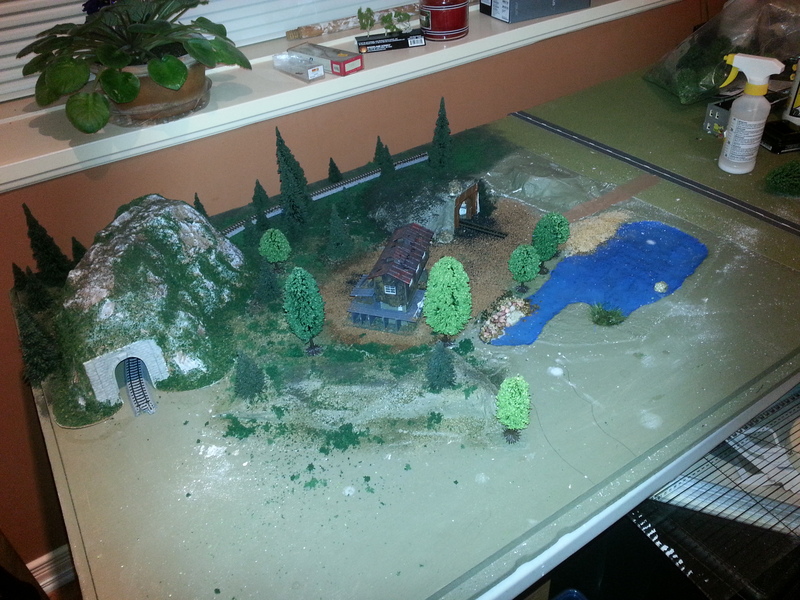 Added some more turf and trees, filling in spaces. 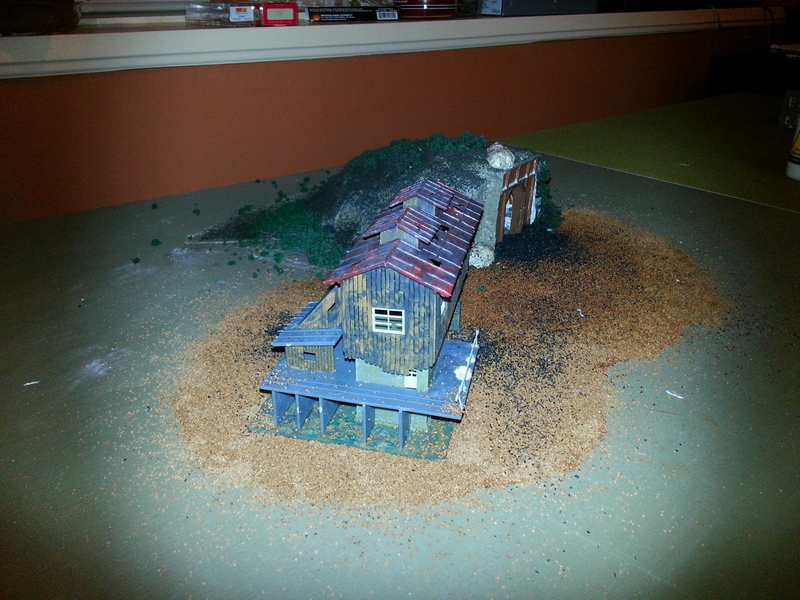 Added base color for dirt road to go to mine. 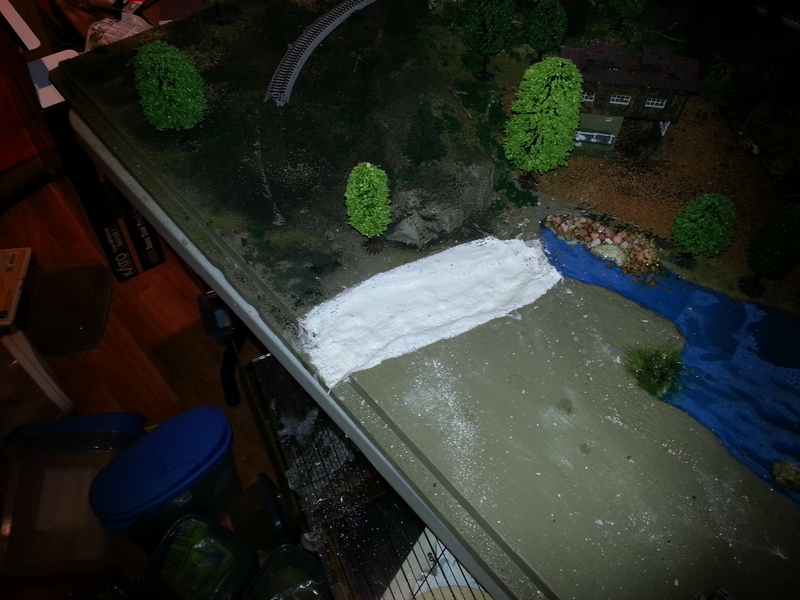 Added plaster cloth to river/brook. Muddy river bottom. 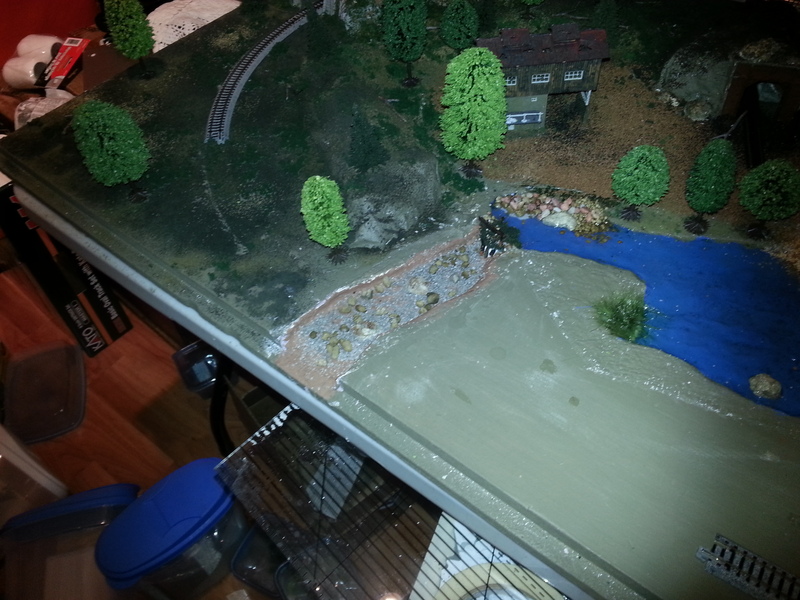 Will add rocks, gravel and beaver dam when paint dries. Then water. 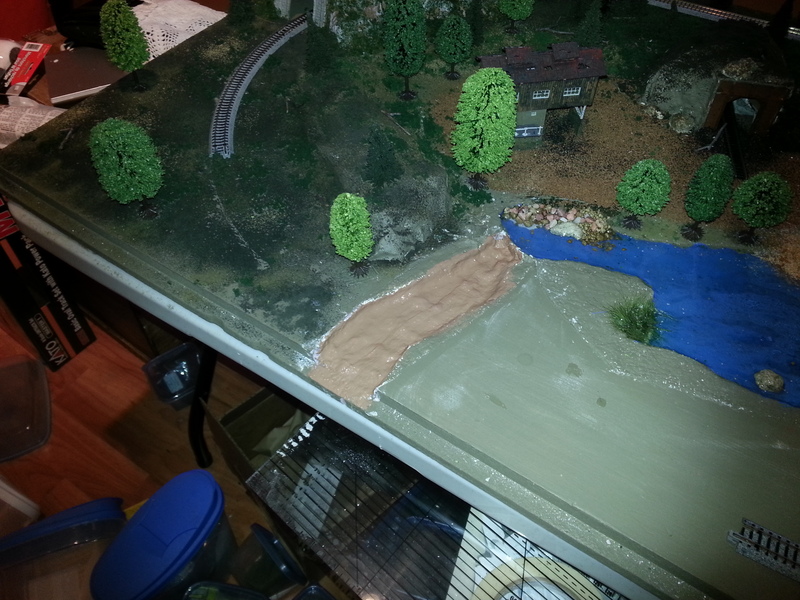 Dam, rocks and gravel added. 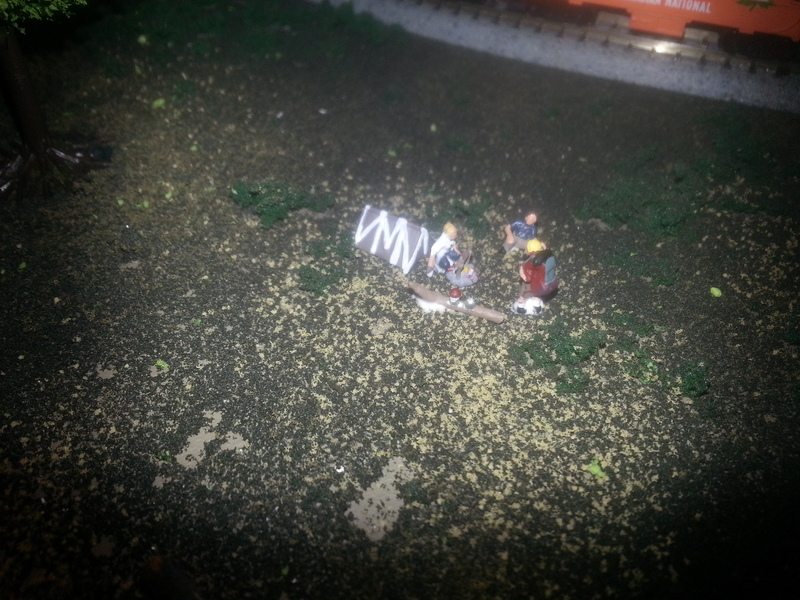 Other than the dirt road, and the addition of people, animals, I think the “wilderness” section is complete. First real look at town area. Not much to see yet, waiting on more buildings to decide on road layout. Few power poles added, ridge in the background. Fenced area will be a graveyard with a church nearby, when I can find a church. Campers near the track, hope the train doesn’t wake them! Gas station and town hall/municipal building added. 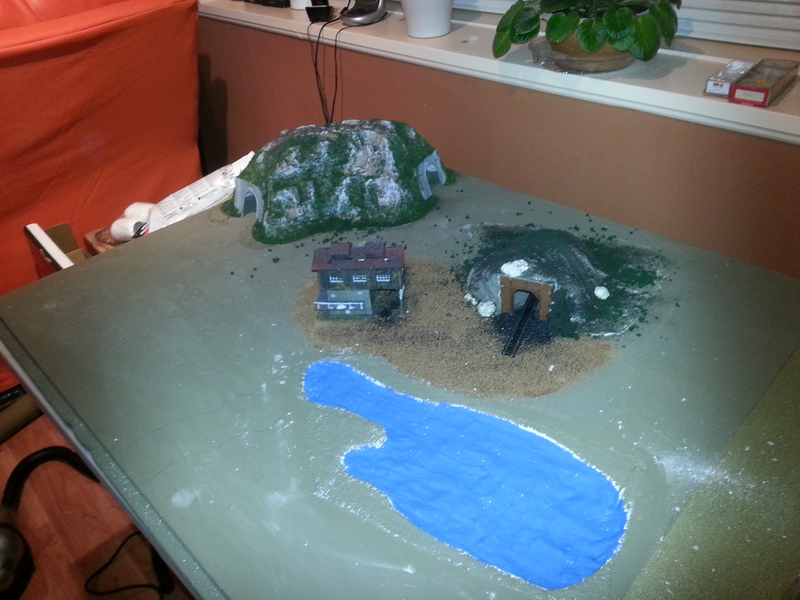 Town nearly done, not all glued down. Top right will eventually be a park. This used to be a partial sheet of pink insulation! Checker players in the park.